A man has been jailed for having explosives, weapons and ammunition following a joint investigation by police in Hertfordshire, Counter Terrorism Policing, and the Eastern Region Special Operations Unit (ERSOU). 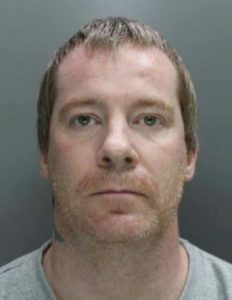 Warren Snedden [pictured] 44, of Welwyn Garden City, Hertfordshire was today, 15 June sentenced at Woolwich Crown Court to a total of 10 years’ imprisonment and to serve an additional five years’ on extended licence. Snedden was previously found guilty on 27 March of having an explosive substance. He also previously pleaded guilty to a number of other offences including: possession of documents containing information likely to be useful for terrorist purposes; possession of firearms and ammunition; and, production of cannabis. Police were alerted to a suspicious transaction on an online auction site in July 2017, where a number of chemicals associated with the production of the explosive TATP were purchased. Further enquiries linked the purchases to Snedden. A search warrant was carried out on 29 September 2017 by Hertfordshire Constabulary at his address in Welwyn Garden City, where officers found the chemicals in Snedden’s bedroom, along with a number of tilt switches, that are often used in the production of improvised explosive devices (IEDs). Police also found component parts of a firearm, an air rifle and over 200 rounds of ammunition – all items Snedden was specifically prohibited from possessing, having previously been convicted of an armed robbery offence in 2001. A small number of cannabis plants were also found growing in his garden. Snedden’s digital devices were seized and later examined. Detectives found copies of terrorist-related manuals and documents detailing how to make and create home-made ammunition, weapons and explosives. Snedden was charged and remanded in custody; he appeared at Westminster Magistrates’ Court on 2 October 2017, and his case was subsequently referred on to Woolwich Crown Court for trial. Commander Clarke Jarrett, Head of the Met’s Counter Terrorism Command, said: “Snedden never gave a full explanation as to what he was planning to do with the array of chemicals, weaponry and ammunition he had stockpiled. What is clear is that what he was doing was putting both himself, his neighbours and the public in great danger. “This was a joint investigation between the Met’s Counter Terrorism Command and colleagues from Hertfordshire Constabulary, as well officers from ERSOU’s counter terrorism policing unit. The excellent work across all three has led to a number of dangerous components and weapons being taken out of circulation. Any suspicious behaviour or activity can be reported via the online tool at gov.uk/ACT or by calling the Anti-Terrorist Hotline on 0800 789 321. Detective Superintendent Rob Bartlett, Head of Counter Terrorism Policing for ERSOU, said: “Although we may never understand why Snedden stockpiled these items and was viewing such material, there is no doubt that he posed a very real threat to society. “This case was a great example of agencies working together in order to prevent someone from causing harm, and removing dangerous weapons and chemicals from circulation. Two counts of having an explosive substance; two counts of possession of a prohibited weapon; two counts of possession of a firearm without a certificate; possession of ammunition without a certificate; possession of ammunition when prohibited; possession of a firearm by a person previously convicted of crime; three counts of possession of a document containing information useful for terrorist purposes; production of cannabis.